Getting fresh drinking water in your home is a convenience we all need and expect. 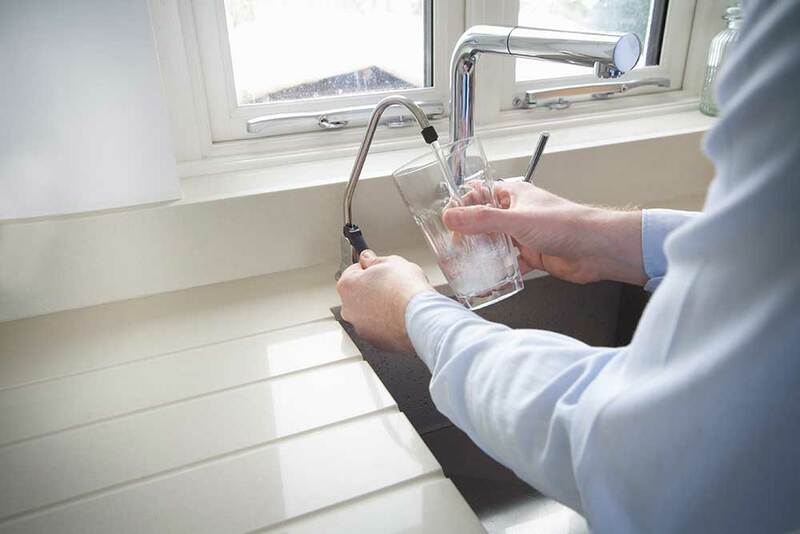 Unfortunately, the quality of tap water coming directly from the faucet doesn’t usually meet our expectations due to taste and/or potential contaminants. In this article we’ll discuss reverse osmosis water systems and compare to carbon filtration from refrigerator dispensers. Many people make the smart choice to stop buying bottled water and use different types of filtration to improve the quality of drinking water in their homes. Two of the most popular methods are refrigerator water dispensers and reverse osmosis (R.O.) drinking water systems. What’s the difference? Does one of these options provide better water than the other? Here are some facts about how these solutions work and the quality of water they provide. Carbon filtration is the method used inside most refrigerators with built-in water and ice dispensers. Carbon filtration involves the use of activated charcoal and is commonly in water filter pitchers as well as air purification products. The activated charcoal filters water through adsorption, a process where molecules, atoms, or ions adhere to a surface. There are tiny holes in the media that trap certain things while letting H2O pass through. Those holes are different sizes and can trap different substances. Carbon filtration is well known for its ability to filter out chlorine, which is found in municipal water and, depending on the level, can make your home’s water smell and taste like a swimming pool. However, carbon filtration does not remove all contaminants. For example, carbon filtration removes some, but not all, heavy metals. It won’t remove dissolved solids or fluoride, which is a concern for some homeowners. It will certainly improve the taste and smell of drinking water, but depending on your situation, some odors and flavors may still be present. Reverse osmosis (R.O.) is a more advanced filtration process that uses multiple carbon filters in conjunction with another unique step: a semi-permeable membrane. This membrane adds another level of filtration to handle the things carbon cannot. Step one is pre-filtration, which uses a sediment filter or GAC Carbon filter to reduce chlorine and remove larger sediment particles. The more particles removed in this first phase, the longer your membrane will last. The second step involves the semi-permeable membrane made of a unique synthetic material. While water can pass through this membrane under pressure, the vast majority of other substances cannot. Things such as lead, arsenic, fluoride, nitrates, and more are separated from the water by the material. The next step is post filtration which is a carbon block filter. This removes any remaining contaminants that could have slipped through the membrane. Water then travels to a storage tank until it is ready to be released at the tap. There is one last pass through a carbon polishing filter between the tank and your glass to make sure your water tastes great. Find out more about how reverse osmosis works here on our blog. Because R.O. systems use more advanced filtration methods in addition to carbon filters, you’re going to get better quality water with reverse osmosis. However, is an R.O. worth the cost and effort when compared to a fridge’s water dispenser? The truth is that both water filtering methods will have costs and maintenance associated with them. For starters, a refrigerator with an ice and water dispenser will cost more than a standard refrigerator. If you don’t already have this type of fridge, you’ll need to determine a way to connect a water line from the appliance to your home’s plumbing. This could mean paying for additional labor. A Consumer Reports article on refrigerator water dispensers also points out that annual operating costs tend to be higher on these models. While the cost of an R.O. system will vary, you can usually get a good model for a few hundred dollars. That’s about how much extra you’d pay for a refrigerator with a water dispenser, except with reverse osmosis, you get better quality water through advanced filtration. R.O. systems are often installed under a kitchen sink and include a special faucet where you can access the filtered water for drinking and cooking. These systems will require some routine maintenance to ensure optimal performance. While it depends on the initial quality of your home’s water, in general, the membrane needs to be changed every few years. All of the contaminant separated from your water is flushed out of the cartridge. This prevents build up and extends the life of the membrane. The pre- and post- carbon filters typically need to be changed every 6 to 12 months. That would also be the recommend time to change a refrigerator filter. One thing some homeowners forget when considering an R.O. system is that the water will come out of the storage tank at room temperature. While a refrigerator can dispense water at colder temperatures, most people are adding ice cubes to it anyway. Adding ice to R.O. drinking water shouldn’t be a big deal, and some people simply keep a pitcher of it in the fridge. Another nice benefit of R.O. water is how the reduced turbidity will improve the clarity of your ice cubes which makes cocktails and other cold drinks look more attractive. The Consumer Reports article mentioned earlier points out that a drawback to refrigerators with a water and ice dispenser in the door is that they tend to break down more often resulting in higher repair rates. They estimate repairs to the dispenser will cost between $200 and $300. The design of these refrigerators can also mean less storage space. No matter what option you choose, in-home water filtration provides significant savings compared to constantly purchasing bottled water. With an R.O. system, you’ll be paying pennies per gallon. Discover more benefits of reverse osmosis drinking water right here on our blog. The water treatment experts at All Florida Soft Water are familiar with effective ways of using both reverse osmosis and carbon filtration to solve water problems. Give us a call at 904-287-0003 or send a message through our Contact Form today!